Camelot, Inc. gets to the heart of the mentoring role in growing and sustaining enterprises—both large and small. In our increasingly “virtual” business and social environment, Paul Oestreicher shows how critical mentoring is to passing along core values to the next generation of leaders. The dos and don'ts in Camelot, Inc. highlight the enduring characteristics of protecting and building personal and corporate reputation. Oestreicher has found a compelling way to teach us as much what to do as what not to do. Oestreicher’s book goes well beyond the depiction of King Arthur and his court. The complicated relationships between leader and managers, the balance between personal and work lives, and the conflict between idealism and pragmatism are as much a part of today’s business world as they were in medieval England. 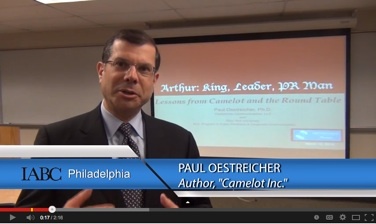 Camelot, Inc. is a remarkable ‘mining’ of lessons from the Arthurian legends. 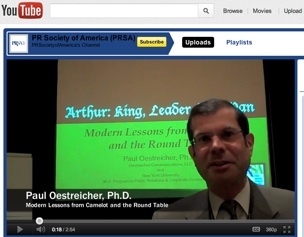 Oestreicher has found timeless prescriptions for achieving excellence in leadership. Camelot, Inc. provides a most thoughtful framework for thinking through some of today's biggest business leadership challenges. It’s a thoroughly enjoyable read. As a child, my introduction to human drama in literature was through the tales of King Arthur and the Knights of the Roundtable. Truly everything you need to know about human values is found in these tales. 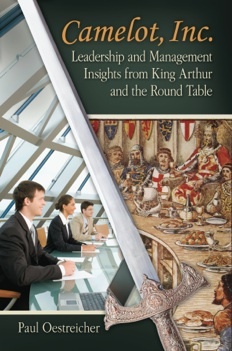 Paul Oestreicher recognizes that these tales hold timeless lessons for leaders as he brings the reader inside the Roundtable. Camelot, Inc. is a great, easily digestible read while commuting or traveling, and a terrific corporate gift. The book is also an excellent source for courses and training programs in business, entrepreneurship, human resources and public relations. Camelot, Inc. has been added to the Museum of Public Relations collection.